thumb because of brain impulses and facial muscles. Also big this week is that your kidneys are producing urine, which releases into the amniotic fluid. 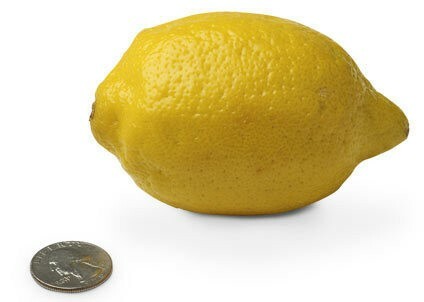 You are about the size of a lemon, measuring 3 1/2-inches long and weighing 1-1/2 ounces. You are stretching out now. Your body continues to grow, but is now growing faster than your head, which makes you look more proportional. Your arms are also lengthening to be more proportional with your body, however, your legs have a lot more growing to do. This week, you are growing lanugo - a thin, peach-fuzz like hair - all over your body that will help keep your warm, but you will lose all that hair before you are born. Hello second trimester! I have been waiting for you! I don't know if it was all in my head as soon as the week started or if it is all temporary but I'm feeling a little better. Morning sickness is slacking off; although still hanging around at least once in the morning. I got some decent sleep this week so I'm less tired. All around I'm feeling a little better. I still have absolutely no idea what to feed myself the majority of the time but I'm making it day by day. My biggest problem is definitely pregnancy brain. I feel so all over the place right now. I forget the simplest things. I can't remember if I asked questions and then when I do ask I can't remember the answer just given to me. I am so just spacey and scattered. Your dad is a little entertained by my pregnancy brain. I feel so much better emotionally now that we are in the second trimester. It was like a weight was instantly lifted off my shoulders. Every day I feel like I relax into this pregnancy more and I'm able to worry less and just be thankful more. What I am loving these days is that at night if I lay very still, I can feel little flutters. I love that already I can start to feel you in there. It's not every day and there pretty much has to be nothing else happening but it's still amazing. How far along: 14 weeks started on Saturday, September 5! How big is the baby: Peanut is the size of a lemon. It's amazing to think of how fast babies grow. Total weight gain: I really haven't gained anything. I have lost a little weight thanks to some major morning sickness, but hopefully I start putting on weight soon. I don't want to be so worried about this baby like I was Addison when I couldn't put on any weight. Clothes: My regular jeans, pants and shorts are just a little tight for comfort. I use my belly band or the rubber band trick when I do wear them. I mostly like loose fitting clothes or things with an elastic waist. I clearly fit into all my shirts, although I do have a little bump already growing. Purchases: I haven't bought anything. We have pretty much everything we need from Addison still. We will need a new car seat and I want a new baby-wearing carrier but otherwise we don't need much. I'll be waiting to buy anything until we know if we are having a girl or a boy. If we are having a boy I get to buy clothes. And if we are having a girl, I will buy a couple of things including an outfit to bring her home in but otherwise I don't need any clothes. Movement: It's a little too soon still but I'm looking forward to it. Sleep:I have trouble getting comfortable these days and I'm getting up once or twice a night to go to the bathroom. I'm hoping that going into the second trimester I start sleeping better. Best moment this week: It's the second trimester. That's not much better than that. 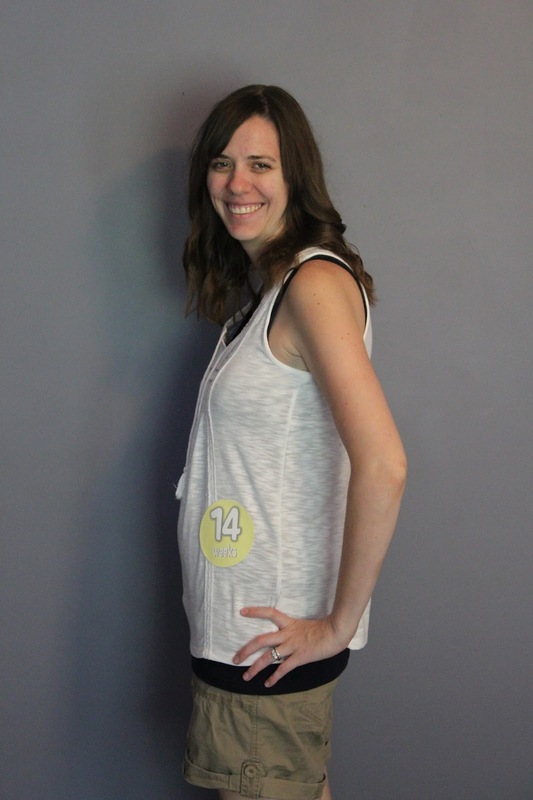 I am so excited about being out of the first trimester and into the second. It's really exciting to me! What I miss: Eating normally without wanting to throw up everything I eat. I also miss sleeping on my stomach. Although I don't have much of a bump, I have a small little bump going on and it's not completely comfortable sleeping on my stomach anymore. What I'm looking forward to: Finding out if we are having a boy or a girl. We have a strong guess around here but you never know. I just have to wait another four weeks or so. Husband update: He's a rockstar. He's a trooper when I have another craving or make another trip to the toilet. He lets me sleep in the car instead of keeping him company when we take road trips. He entertains the kid while I have no energy to do much more than sit there. Although he doesn't talk about it much, he's excited. The pregnancy part isn't so much fun for him since I hate being pregnant and frankly I get a little mean when pregnant, so he's just bidding his time until he gets to be a father again. And let me tell you, he is one of the best out of there!